I've come to realize that a lot of people just have no idea how to apply blush. I never knew this was something that stumped so many people! And before I get into more detail, I would like to note that there really is no "wrong" or "right" way to apply blush- it's all a matter of preference. The way I'm going to show you guys today is the way I find is the most flattering on all face shapes. It's easy to get carried away with blush, but it's important to use a light hand when applying it. Here's a pro tip: wait to apply blush after you do your eye makeup and lips. If you're doing a bright lip, you will not need to wear a lot of blush. Having your lips and eyes done first will help you gauge how much blush you actually need to wear. Total game changer! In all of my years working as a makeup artist, this is hands down the most flattering way to apply blush. I like starting from the hairline and working my way inwards, almost like contouring my face with the blush. 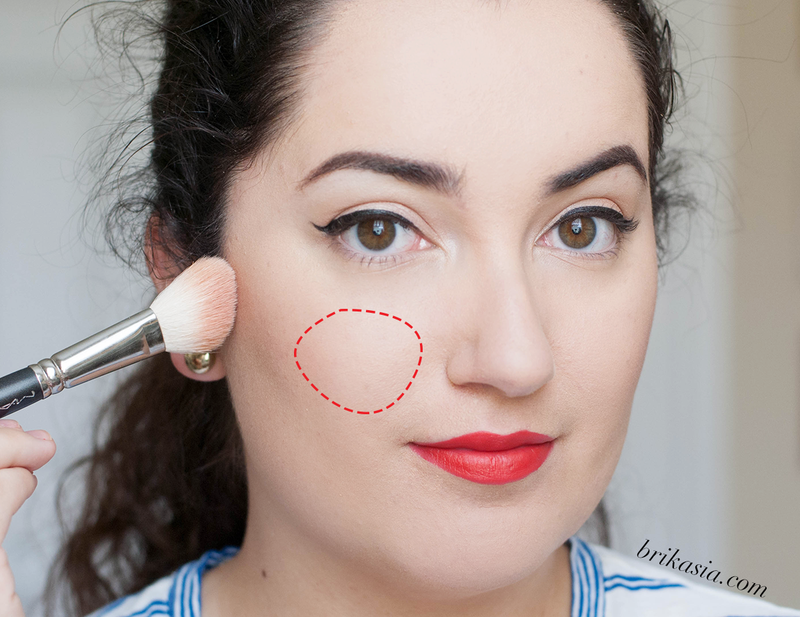 You aren't applying the blush in the hollows of your cheekbones, and you aren't applying it on the tops of your cheekbones... You're doing it right in between those two areas. Now let's talk about tools. I never recommend using the blush brush applicator that comes with most blushes. Get a real blush brush! The one I'm using in these photos is the MAC 168 brush, which is an ultra soft brush and is one of my all time favorites (it's great for highlighting, for blush, and for contouring). If you don't want to splurge on the MAC brush, then I absolutely recommend the Real Techniques Blush Brush. It's a total steal and incredibly soft! So what do you think? 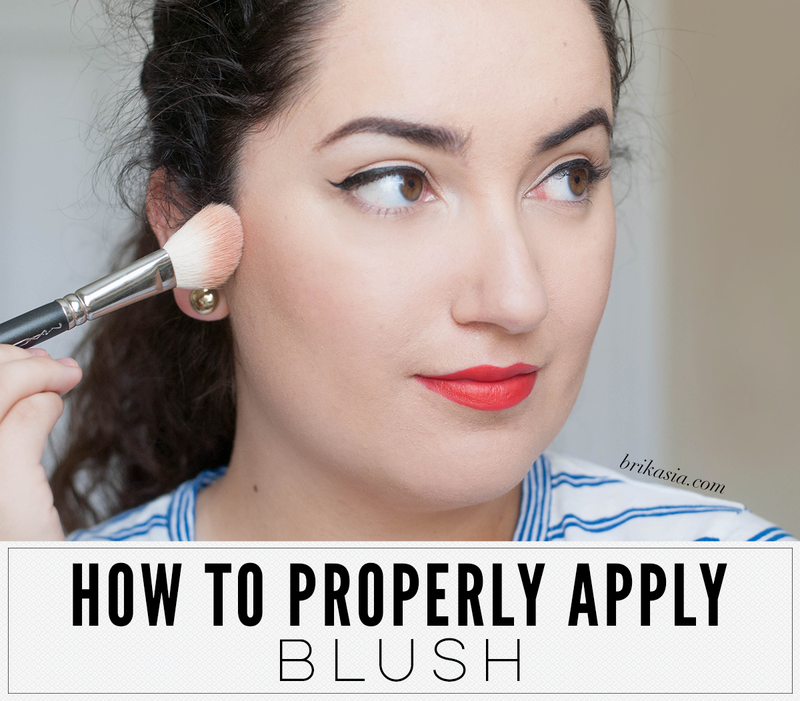 How do you apply blush? I do tend to apply it on the apples and then along as shown, but it is too much with all that! I definitely need to get in the habit of not applying it on the apples. Great post! You can totally apply it to the apples of your cheeks, but with a light hand. The way I show above it PERFECT for a night out if applied more heavily, or for daytime with a lighter hand!